Sioma Zubicky was born in the German Circus Busch, as the son of Russian-Jewish parents. While father Boris performed as an acrobat and circus rider, his son showed an extraordinary talent for playing musical instruments. 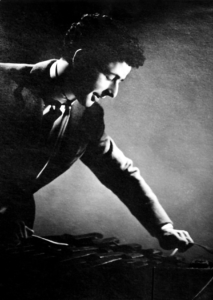 Zubicky’s master discipline was playing xylophone. After performing several years in circus and vaudeville shows throughout Germany, Czechoslovakia and Switzerland, Zubicky and his family moved to Paris, where, in June 1940, they experienced the German occupation of Paris. From then on, they feared that they would be discarded as Jews. However, they did not hide. Instead, Zubicky and his father chose a different tactic: they went to the lion’s den, so to speak, and began to entertain the occupying forces. Given their contacts with the French resistance, Zubicky and his parents were interrogated by the Gestapo in the autumn of 1943. In the interrogations, mother Annie revealed the Jewish origin of the family. Father Boris managed to escape. However, 17-year-old Zubicky, his 11-year-old brother Viktor and his mother Annie were deported to Auschwitz via the transit camp Drancy. Zubicky received the camp serial number 146021. His brother and mother died in the gas chamber. After his liberation near Dachau in the spring of 1945, Zubicky returned to Paris. In 1947 he accompanied singer Edith Piaf on her tour to Sweden. It was there that Zubicky found his happiness and settled down. Later in his life, he considered it as his duty to teach young people about the Holocaust. Zubicky has also presented his own experiences in an autobiography. Source: Sioma Zubicky: Spiel, Zirkuskind, spiel. Erinnerungen eines europäischen Wunderkindes. Frankfurt 2005.